In medium bowl, make guacamole by mixing avocados, green chiles, lime juice, red onion and cilantro, mashing slightly; set aside. Plate Chipotle Sauce ingredients in blender or food processor. Cover; blend on high speed until smooth. Pour half of sauce in 10-inch skillet over medium heat with chicken, reserving 1/2 cup for topping. Cover skillet; heat chicken and sauce until warm. Meanwhile, heat oil in 10-inch nonstick skillet over medium heat. Add 1 tortilla. Cook until starting to puff up, then turn over. Once second side is puffed up, remove from skillet; drain on paper towels. Fold each tortilla in half, and top with slightly less than 1/3 cup chicken mixture. Top with guacamole, a drizzle of reserved sauce, lettuce, tomato and cheese. If you want more zesty chipotle flavor, dust the puffy tortillas with chipotle powder after draining on paper towels. 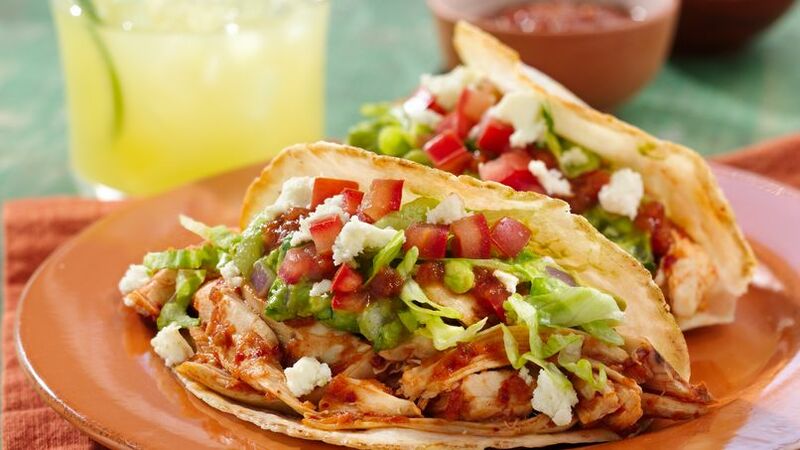 Puffy taco shells stuffed with pulled rotisserie chicken in chipotle sauce. Topped with fresh guacamole, salsa and favorite taco toppings like lettuce, tomato and queso fresco.